A feature of many contemporary gardens designs, swimming pools are much more stylish than they ever used to be with many more types available. In some garden settings they are the central design feature which the rest of the garden is built around. In others, the pool is subtly installed so that it fits in with an existing garden's design. What are the options when it comes to contemporary pool design these days? Let's take a look at the types of up to the minute designs currently available and some of the other key factors to know about when choosing a pool that will fit in with a modern garden. One of the commonest versions of swimming pools found in domestic gardens is a dug out area of land which is then lined with concrete. These pools offer the distinct advantage that they are simple to construct and that the height of the pool corresponds with the lie of the land. If you have a lawn that you want to turn part of into a pool, then a concrete lined version which has been dug out can be the best option. These tend to work best when they are lined or painted and have a section of paving laid around them, perhaps connecting with an adjacent patio area. Raised pools, on the other hand are more of a dominant feature in a garden, due to the fact that they stand proud of the land. In some cases, pool designers construct a frame out of wood in which a prefabricated pool shell is housed. The frame might also have a brickwork base, depending on the amount of pressure the sides of the pool will have to cope with. These sorts of pools work well in sloping gardens where one side of the pool can be sunk into the ground while the other side stands proud. Modern swimming pools are much more varied in their designs than they ever used to be. One of the most recent design innovations that pools now feature regularly in American homes is the so-called infinity view. Ideal for a pool that enjoys a good view over a landscape or the ocean, the infinity view is when the pool appears to have nothing retaining it on one side. In fact, these pools do have four walls. One, or sometimes more, is made to come up just beneath the water line, so it looks as though the water is sitting in the landscape without any means of support. When you jump in the pool, the water simply flows over the hidden poolside and returns into the pool via a concealed capture-and-flow system. Circular pools are also another popular choice for modern gardens where the addition of a rectangular shape would break up the design of lawns and borders. Sometimes circular pools are installed with overlapping circles of differing sizes, so don't imagine that a circular pool means just one round patch of water, like an overly engineered pond. Figure of eight and other designs of circular pool, like kidney bean shapes, are equally as popular. Although most garden pools have consistent edges where it is possible to jump or dive in, another fad is for beach type pools. These pools are great for learner swimmers and for recreating the safe environment of a shallow beach. Essentially, the design idea has one edge of the pool which connects to the land seamlessly. The access to the pool integrates with a nearby deck or patio and extends into the water with a shallow approach, allowing swimmers to walk into deeper water at their will. 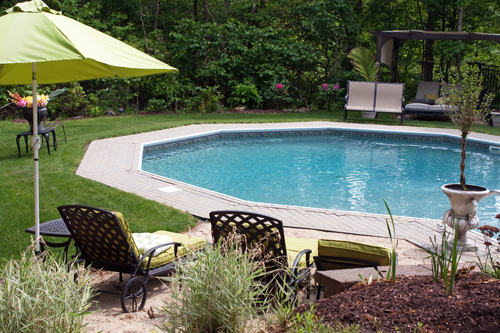 Training pools, or lap pools, are another relatively recent design that tend to be incorporated into smaller gardens. These pools are ideal if you have limited space but still want to be able to swim. At their simplest, they are long and thin pools which allow you to swim in one direction, to turn around and to come back. They are for people who use swimming for fitness rather than fun and are suited to only one or two people at a time. However, they often make for an attractive water feature in more compact gardens and are very useful for keen swimmers. Swimming pools heating systems are essential for using a pool in anything other than high summer. The larger the pool, then the more energy your swimming pool will use up. Many pools rely on solar power to heat them directly, but are supplemented by gas heaters, electric heaters or heat pumps. When installing a new pool, make sure it is in a location which will see plenty of sunshine in the summer, with no trees or other large foliage causing it to be in shade. It is also worth investing in a cover which will help to trap heat in the water overnight.